← K.O.D.O.M., Thy Name is Annoyance! This is another new category of exploration here in Smartassville … the twisted mind of John Byrne. Now, don’t get me wrong. Like many of you, I worshipped all things Johnny B. back in the day. Loved X-Men. Loved Fantastic Four. LOVED Man of Steel. But, now and again, I find a panel of two that really demonstrate how truly odd he was. Not in the superhuman plots, mind you. In the glimpses of “real life” he included — what his warped Canadian brain thought of as normal. HINT: It usually involved characters with mullets and cut off T-shirts. Like this panel below from Avengers West Coast #54. 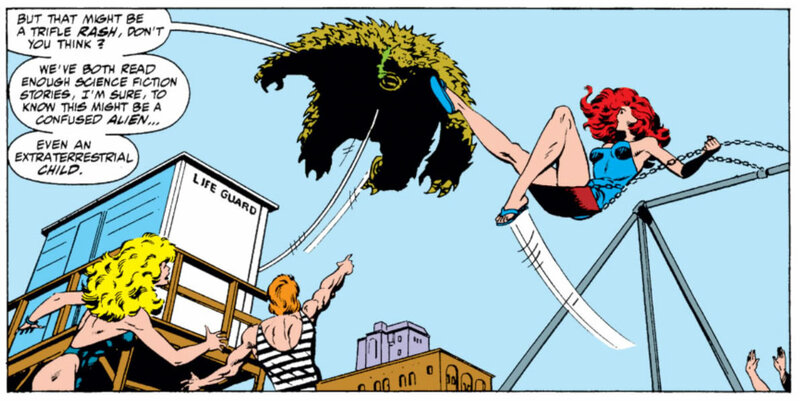 It’s not really terrifying that Wonder Man is carrying a giant scaled monster above a city … but, rather, that there’s a beach where mulletted dudes wear stripped muscle shirts from the 20s and Herculean infants (seriously, look at the baby arms in the bottom right corner) push grown women on swings. What kind of frelled up scene is this!?!? Please, Wondy, drop the monster there! Rid the world of this insane place! @DazzledFirestar: To be fair, John Bryne’s weirdness is not due to him being Canadian. Trust me, as a Canadian, that’s still weird and scary. Judge’s ruling … yep. We’ll accept that. John Byrne not weird BECAUSE he’s Canadian. He is weird because he’s weird and he HAPPENS TO BE Canadian. Important distinction. Thanks, Daz. This entry was posted in Comic Book Humor, Comic Books, Marvel Comics and tagged Avengers, Comic Books, Comics, John Byrne, Marvel Comics, Wonder Man. Bookmark the permalink.